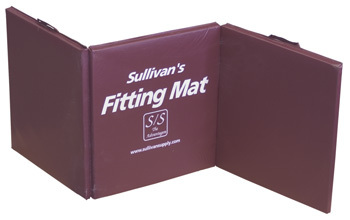 Sullivan's Maroon Folding Fitting Mat [FMF] : Highland Livestock Supply, Ltd, Products for all of your show animals! 30"w x 7' long - This folding mat is covered with vinyl for a nice finished appearance. Folds in two places and has built-in handles to make for an easy to carry mat. Measures 30" x 28" when folded.